A kleptomaniac, as those of you in the field of letters may know, is someone obsessed with collecting and hoarding things. The aptly named Klepto is character in our focus, preparing himself to steal...something. The developer and game don't provide much backstory, so the natural assumption is that Klepto the pig was bitten as a piglet by a radioactive spider possessing artificial intelligence. This gave him the ability to be sentient along with an appendage enabling tasks like grappling and gliding like a propeller. What's that you say? Don't believe me? I invite you to come up with a better theory! However he came into existence, your mission(s), should you choose to accept it (them) are to lead him through certain levels, gathering collectables and trying to find secrets along the way. Oh, and no pressure, but you're on the clock too, timer counting down as you go through in a mad dash to try and complete it fast enough to metal. But before I get ahead of myself too much, let me explain. 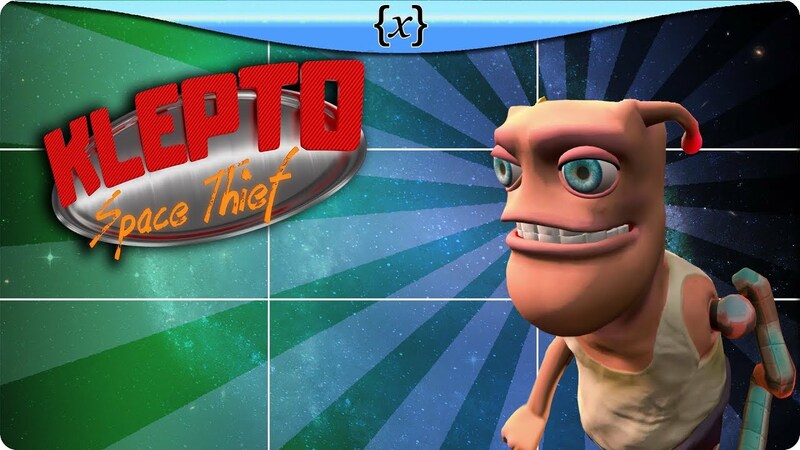 Klepto - Space Thief is Klepto's ambitious plan to prepare himself for a (possibly) intergalactic heist. By running himself through complex simulations, he hopes to prepare and be in tip-top condition for the real thing. Although Klepto's simulations are supposedly made out of cardboard, the dangers will prove to be all too real as you navigate him through. Avoid things like electricity that will give Klepto a nasty shock, falling into the infinity beneath him in many of the levels, and of course, his arch nemesis - falling into water (though only sometimes, interestingly enough!). Klepto - Space Thief doesn't force you into a strict set of goals, even though there are multiple layers to it, and that's part of what makes it brilliant for platformers of varying skill levels. There are nine separate levels in two completely different worlds: five in Klepto's misguided visions of the Wild, Wild West, and four more in the "Jungle Temple" type environment, perhaps inspired from Aztec civilization. One thing you'll notice if you spend any length of time playing through Klepto's world is that the worlds are both diligently structured and huge. In some levels, you'll climb through obstacles and be able to look way down at where you were formerly and the barriers you have overcome so far. While this vertical structure runs through most of the "Wild West" style worlds, some of the "Aztec" worlds feature a different style, whereby you unlock new areas by solving puzzles, retracing some of your steps along the way. I can appreciate the amount of effort that must have been spent making all of this consistent and it's one of my favorite things about this game - right up there with the "smiley-faced" construction robots you'll pass along your way. After completing a couple of the first levels, which function both as challenges in their own right and as a tutorial/introduction to at least the basic controls, you'll be able to go through one set of worlds or the other more or less freely. Most of the controls are quite well down and very tight, but I did take slight issue with some parts later on when you fly Klepto along with a glider. In these parts it feels quite odd, as if some large chunk of control is taken away, forcing you to overcompensate to navigate through those parts. For most of the game, though, controls are more than satisfactorily tight. There are also a few issues with placement of weights on tiles to press them down and unlock areas within levels. Sometimes when Klepto picks up/puts down objects, they stray a little far. Combined with the ability of them to jump through walls, this can lead to a bit of frustration and can cause one to have to repeat a large section, potentially ruining a speedrun. 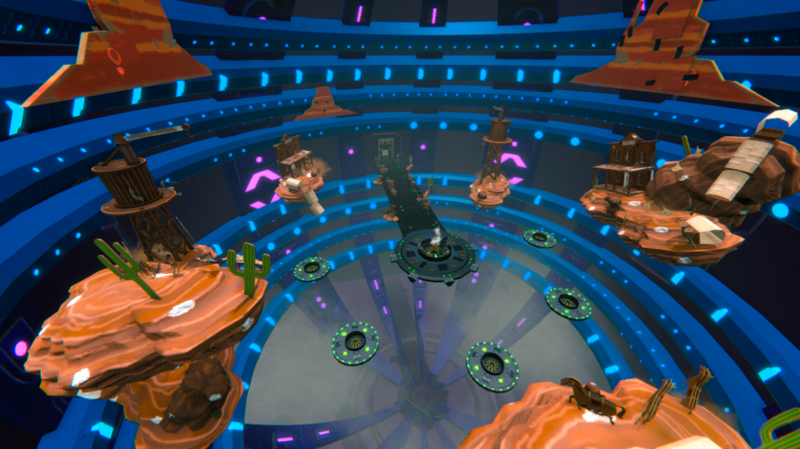 The controls are covered in more detail in-game, but a basic overview is as follows. Use [WASD] to move around (unfortunately, arrow keys are not supported). 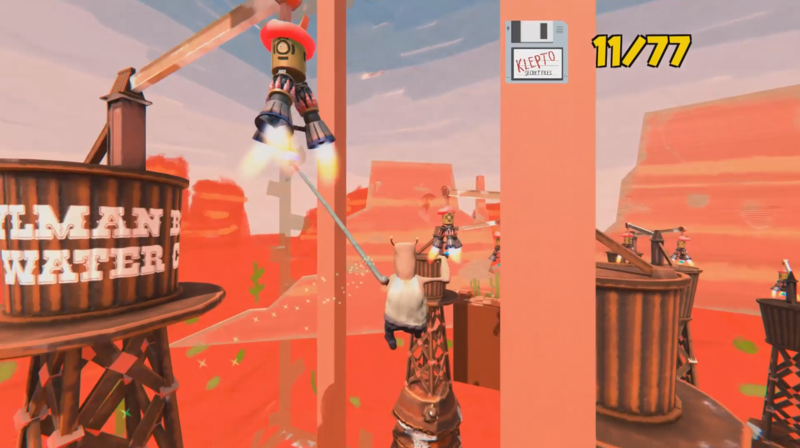 Press [Space] to jump, press it a second time to execute a double-jump, and hold it subsequently to glide with the impromptu propeller on Klepto's appendage. As I've mentioned previously, the levels are large and some can take some time and practice going through. This is why it is all the more fortunate that Contrary Scholars has included many checkpoints going throughout the levels. When passing a cardboard cutout of himself (how vain!) the game will hold your progress there and restore you in front of Klepto's eerily two-dimensional counterpart should to fall, be electrocuted, or drown to your unfortunate demise. And that's only scratching the surface - some of the more exciting aspects like grappling through the air and strapping a glider on your back enter in later on. There are a number of side goals in each chapter as well. Three metals - bronze, silver, and gold - encourage you to beat a specific time as you run through the levels. In case you have noticed, you're timed automatically starting from the beginning. But if speedrunning isn't your cup of tea, don't fret - you can just ignore the timer at the top and it will have no consequence on progression throughout the levels. If you are a kleptomaniac, you're in luck, as there are things to collect. Not only has Klepto scattered many floating drives that look like floppy disks (is he just old-fashioned? ), but there is also a secret hidden in each level. What kind of secret, you ask? You'll know when you see it. Keep looking! I think you'll have a marvelous time playing Klepto - Space Thief. But even if not, you'll still get to see something pretty darn close to a pig flying, and that's not something you encounter every day!